If you’ve ever tried a slot machine, you know that slots can’t be won by devising a strategy like in the case of other games like poker, or blackjack. Slots are games of luck and most people play them for their attractive jackpots. However, some players consider both the jackpot as well as the chances of returning their wager when they sit behind a real slot machine. After all, if you’re not lucky enough to hit a jackpot, you at least want to win some of your money back, right? That’s where the house edge comes in. 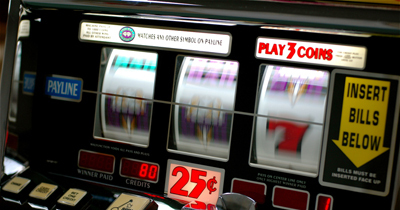 Basically, the house edge in slot machines is calculated with the help of the RTP (Return to Player Percentage), which most game makers freely share. The formula is pretty simple. You just subtract the Return to Player percentage from 100 and what you’ll end up is the house edge. Of course, the RTP does not apply to a single game but depends on your play time, i.e. the more you play the slot the more likely are your chances of reaching that exact RTP. The reason why RTP is important is that it can help you find games that are more profitable, instead of just throwing your money away on slots with high house edges. It can even help you make some bucks by spending none, as it’s possible to play online for free. Relic Raiders is a popular NetEnt game with a theme that is very similar to Tomb Raider. The slot is 5-reeled with 50 pay-lines, no progressive jackpot, and a hidden-tomb bonus feature where you’ll go relic hunting to win the Mystery Win Bonus. You can also win free spins and the 10,000 base jackpot. It’s definitely a fun game to play, with great visuals; in fact, the only thing that might put you off is the 10% house edge. Wow Pot is a classic slot game with 3 reels and a single pay-line. The theme is “classic”, with traditional slot symbols, and it has a progressive jackpot (the WOW sign is the wild symbol), no bonus rounds, and a highest payout of 1000x. The graphics and visuals are exactly what you would expect from an older game, and that’s one of the reasons why many nostalgic players like it. However, the house edge is 10.37% - definitely not a fair percentage. One of the more popular Rival’s games, Eggstravaganza is an Easter-themed classic slot game, with a single pay-line and 3 reels. There’s no progressive jackpot or bonus features, but this shouldn’t come as a surprise since the game is not very new. There are free spins, however, as well as a highest payout of 2,500x. The graphics are nicely done and make the slot pretty playable, but with a house edge of 10.51% you’ll be better off playing a different holiday-themed game. Major Millions is one of the most popular Microgaming slots that helped make the company what it is today. On the off-chance you haven’t played it, it’s a military-themed 5 reel, 15 pay-line game, with a progressive jackpot that can sometimes amass to a pretty large sum. However, even though the game still holds its charm, you can’t help but notice its outdated visuals. Take that and combine it with its large house edge of 10.63%, and you’ll end up with a game that doesn’t really attract. As the name suggest, Ice Picks is an ice-themed game. The slot has 5 reels, 20 pay-lines, up to 25 free spins that can be won by the compass symbol, a 9000x jackpot and a bonus round that you can get into by landing 3 treasure maps. Ice Pick’s graphics and visually appealing background is what makes the game playable, however, it also has one of the worst house edges – 11.63%. Mega Moolah Isis is the fourth slot having the Mega Moolah progressive jackpot. The theme is Egyptian, like many other popular slots online, so be on the lookout for any related symbols. You get 5 reels and 25 pay-lines, and 4 progressive jackpots: Mini (10+ credits); Minor (100+ credits); Major (10,000+ credits); and Mega (1 mil+ credits); The game is nicely made and it mostly attracts slot players due to its randomly generated progressive jackpots, however, it is definitely to be avoided as it has a staggering 12% house edge. Win Mill, as the name suggests, is a windmill-themed slot game inspired by the Dutch countryside. It’s a 3-reel game with 5 pay-lines, and 2 bonuses – the first won by lucky-guessing which hand holds a gold coin, and the second by catching falling gold coins with your mouse - all in all not very easy to do. The graphics are nicely done, although they are somewhat confusing because you can easily get lost in the screen. However, no matter how tempting the slot may seem, you should keep away from it as it has the highest House Edge around – 14%.